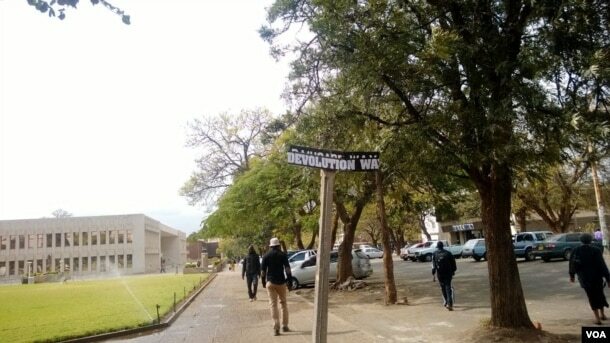 Some youth in Zimbabwe’s second largest city, Bulawayo, have defaced Robert Mugabe Way sign posts and renamed the road Devolution Way as a form of protest against the government’s failure to devolve power to provinces, a provision enshrined in the country’s constitution. Zapu regional spokesperson Iphithule Maphosa dismissed reports that party youth carried out the exercise, noting that only the Bulawayo City Council has authority to handle street names. Council officials declined to comment saying they removed some of the defaced sign posts saying they are carrying out investigations. Police declined to comment. People in the region claim that President Robert Mugabe’s government has marginalized them since independence from British rule in 1980. Maphosa told VOA Studio 7 that they commend any form of protest to force the government to devolve powers to provinces. Defaced Robert Mugabe Way sign post in Bulawayo. Chapter 5 of Zimbabwe’s constitution stipulates that governmental functions and responsibilities must be devolved to the people at all appropriate levels. Section 5.3 of the constitution clearly states some of the objectives of devolution are to give powers of self-governance to the people and enhance their participation in the exercise of the powers of the state and in making decisions affecting them; to recognize the right of communities to manage their own affairs and to further their development; to promote democratic, effective, transparent, accountable and coherent government of Zimbabwe as a whole and to preserve and foster the peace, national unity and indivisibility of Zimbabwe. It further states that devolution is designed to ensure the equitable sharing of local and national resources throughout Zimbabwe and to facilitate the decentralization of state institutions, their functions and services from the capital of Zimbabwe.